One woman. One motorbike. A world to discover. Exploring Northern Thailand was on my list for several years now. I’d already visited Bangkok multiple times, learned how to dive in Ko Tao and had some great parties on gorgeous beaches in the south of Thailand. But I’d never been to the North. When I realised that I would cross the Myanmar-Thailand border in the North of Thailand, I was stoked. And then the inevitable happened. I got disappointed. Since I started this motorbike journey, my travels started to focus on the journey instead of the destination. On previous travels, it was all about the destination. Upon arrival in a new place, I would vigorously explore the surroundings, see the sights, do the activities and tick it off my list. Traveling by motorbike changed this completely. I lost my interest of visiting all the sights and doing (often expensive) excursions. Now, it was all about riding beautiful roads and going into remote areas unreachable by public transport. That said - I got disappointed when I rode from the Myanmar border to Chiang Rai, and later on to Chiang Mai. The road was in impeccable condition. Smooth, wide, brand-new tarmac. But the views less majestic than I expected and there was a lot more traffic compared with Myanmar. I barely switched on my GoPro to record anything as I didn't think the surroundings were worthy enough. The hot spring that I spotted on my way to Chiang Mai was the most interesting sight of the day, and the people boiling eggs in it, did made me laugh! My time in Chiang Mai was mostly spend on getting my bike serviced, searching for better motorbike gear and riding around Chiang Mai with the local biker group that I met. After spending New Years Eve in Chang Mai, I left for Pai. The first hour of riding turned out to be the same disappointing affair. Smooth highway and nothing interesting to see. So I decided to step up my game. To see the beauty of Thailand, perhaps I had to approach my riding differently. I stopped, checked google maps and chose the first small side road that I saw on the map. It turned out to be the best decision of the day. Soon after taking this road I noticed a small sign on the side of the road, saying: Elephant Retirement Park. I took the turn and rode down a short gravel path to a big house. The friendly owner came out to greet me immediately. He couldn’t believe I rode my bike all the way from India to his house! Elephant on the road on my way to Pai! I chatted for some time with him and he talked about how he started this Elephant Retirement Park. He was rescuing elephants for many years now. Elephants that had been working in the logging industry or carrying tourists around for their entire lives, got to enjoy a peaceful retirement here. He started a breeding programme as well, so there were 3 little baby elephants trotting around. After having lunch there, I continued to Pai, riding a dirt track past rice paddies and through jungle. 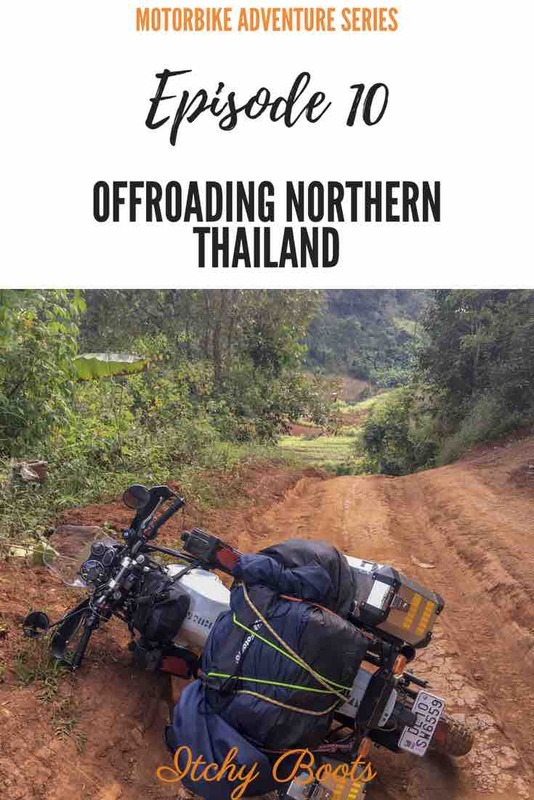 This gave me the taste for off-roading in Thailand! When I was riding on terrible roads in India, I was hoping for better roads. When I was riding on smooth tarmac in Thailand, I was hoping for difficult, horrible roads again. I am impossible! To escape the gorgeous, smooth and open wide highways of Thailand, I started venturing off the main roads. Most of the times it turned out to be a success, like when riding to Pai. But not every time. The stretch of road from Pai to Mae Sariang is quite famous for its hundreds of curves. But I was tipped off to a bamboo bridge, about a half hour drive in the other direction. And guess what, after visiting the bamboo bridge (which was magnificent), I looked at Google Maps again. And what did I spot? That’s right, a shortcut! Instead of backtracking that half hour, I could cut off a large part of the highway. Going by a small road. That was like music to my ears so I took off in that direction. It started off okay. The road was paved and wide. It then turned into a road which was paved and narrow. Then to a road which was unpaved and narrow. Until finally it could hardly qualify as road any longer. The difficulty of riding it was in the deep carved out tracks, probably caused by pickup trucks in the wet season. The tracks made my bike fly all over the place, until the inevitable happened. To be honest, it wasn’t as spectacular of a crash as it looked like. I almost crashed, but could stop the bike just in time. But my back wheel got stuck in one of the deep tracks and the bike did not want to move a single inch. After several minutes of trying to get loose, I decided that I would have to step off the bike. In a split second I lost balance of the bike and there it went while I was stepping off. Fail! There was not a single soul in sight so I couldn’t ask anybody to help me get it back up. I took off the luggage and with all of my power (and sweat) I managed to get it back up. Getting the bike out of the deep track took several more minutes of pushing, pulling and sweating - but I did it! The road became even trickier after this and even though there were a few close-calls, I didn’t drop Basanti again. I have to admit, that after more than 50 kilometers of ploughing through mud and taking huge bumps, I was quite happy to see some tarmac again. At the end of the day, I inspected the damage of the day’s fall. The knuckle guard broke, the steering wheel was loose and my brake pads were squeaky. All in all not too bad. The knuckle guards were made from plastic so breaking it didn’t really come as a surprise, the steering wheel was easily tightened again and the brake pads cleaned. All set for new adventures in Thailand, bring it on! Save this article for later? Pin it!